Tableau is an easy to use visualization tool that allows you to connect to various types of data sources, visualize and create interactive dashboards and story points. I had both HANA Client and HANA Studio installed in the System. The reason behind Tableau not getting connected was that my HANA ODBC Driver name was HDBODBC32_003. I tried uninstalling HANA Client and installing it again - but the new ODBC driver also got installed with name HDBODBC32_003. The reason being that there was another ODBC driver entry with name HDBODBC32_002 and it was corrupted. Once I deleted the HDBODBC32_002 entry from registry and uninstalled and installed HANA Client again, ODBC Driver got installed as HDBODBC32. After that I was able to connect to HANA using Tableau Native Connector. Then select the Schema and then the table or view to which you want to connect. If you want, you can even write the custom SQL Query to get the data from HANA. Now drag your View/table to get the data from HANA. If you are using Tableau 8.2 and your View has input parameters or variables then you will get a popup asking to enter values for input parameters or variables. 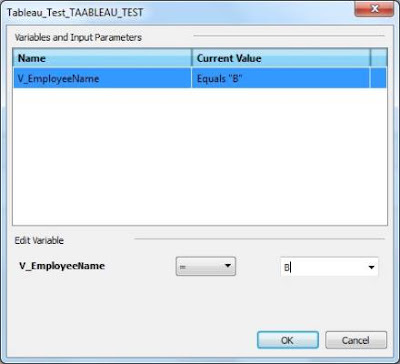 Note: If you are using Tableau Version below 8.2, the Input Parameters are not supported. 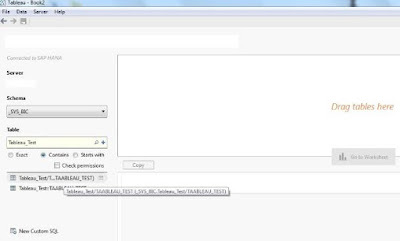 Then choose whether you want to connect to HANA using a Live connection or want to create a Data Extract and then preview the data. After this, click on Go to Worksheet and create the Visualizations you want. Then you can combine different visualizations into one dashboard or combine dashboards and worksheets to create a Story Point. Once the dashboard is created there are multiple ways to share it. You can publish the Dashboard to Tableau Server or Tableau Online. There is also a free tool provided by Tableau called as Tableau Reader. It can be used to view and interact with Tableau Packaged Workbooks. But its drawback is that it can't connect to Live Data Source and if you try to open a Workbook that has Live Data Source, it throws the below error. To resolve this error, instead of creating a Live Connection to Database you will need to create a data extract that will save in your local Desktop. As Tableau has started supporting Input Parameters for Data Source in HANA, I hope that later we get an option to expose these parameters directly to end users and then it will become a great platform for even reporting purposes using the full processing power of HANA and great visualization capability of Tableau.